Too scared of facing Shapovalov? Smart move from Andy, seems like he's finally learning to use his brain instead of his heart a bit more. Baby steps, he needs to be careful when coming back from injury in his 30s to not overplay right away. BO5 would have been too big of a task physically at this point. It was great to see him display his wizardry on grass again, even if for a brief moment. Wish him full recovery by the end of the year, the game's much better with in-form Murray in the mix. The dude who will retire before Fed is Stan sadly. Mury will play. Wise move from the magnanimous Muzz. Though I am disappoint that we will be deprived of his mellifluous mutterings this Wimby. Don't think Murray's going anywhere anytime soon. If he did, he'd play Wimbledon this year. This move IMO shows he's focused on the future instead of the now. Nadal fans can breath a sigh of relief, the two time Wimbledon champion isn't in his quarter anymore. Murray is becoming the GOAT of withdrawing from a tournament after the draw is announced. Smart move from Murray though, he didn't look physically ready to play five sets, looks like he's focused on the future. Will be interesting to see where he next decides to play. 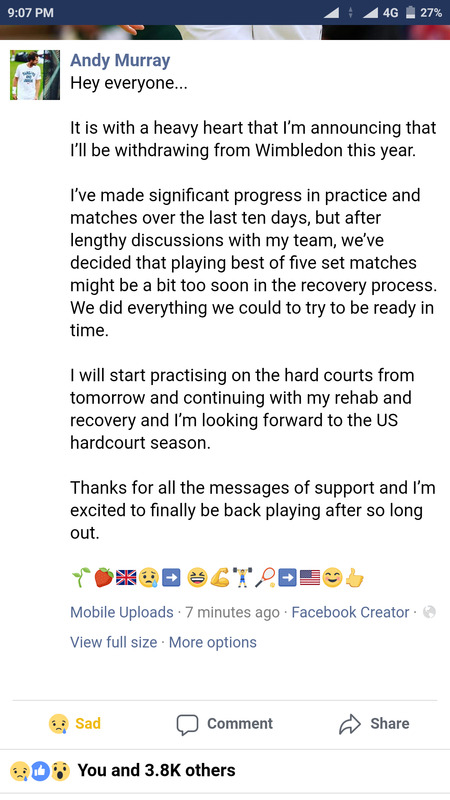 Hopefully he's back on court soon. Small comfort given that the mighty Thiem is still there. Slam beasts Zverev and Kyrgios too. He isn't ready and he knows he isn't. It's for the best. Will be interesting to see where he next decides to play. Once again, if he was he'd actually play Wimbledon. There's no way he leaves the game without playing it one more time, the guy's one of the most emotional and passionate tennis players I've seen. Yeah, wouldn't want to see him out there wrecking himself. All the best to him. That was the best arguement they had though . I think his career is over. Pfft. Typical Murray it was pretty obvious 1 month ago he could not be match fit ready to play best of 5 sets if he was constantly deciding at the last minute if was ready for the warm up tournaments. Celebrating the injury and withdrawal of a player? Pathetic. are the scum of the earth. Jesus there are seven LL's in the draw so far. Most there have eevr been? In that sense. Happy scum! Stan should have taken a similar approach on his comeback. Where's Facebook's Haha emoticon when you need it? Bit surprised to hear this as everything seemed to hint at him being prepared to play. Wonder why he and his team finally decided it was too risky? He obviously knows his own body and what he thinks it is capable of at the moment. Wonder where he will head to next? Is Newport now a possibility? Still sad to see him not playing Wimbledon though for the first time since 2007! Stan is playing so so bad right now. I am not so quick in saying the word Finnish but Stan does look Finnish to me. As the bookmakers note, Shapovalov is likely to lose to Jeremy Chardy in round 1. This is hilarious stuff. 7 lucky losers playing Wimbledon. What a joke. Pretty sad,thought Could have seen him in action after such a long time.Only watched bits of Kyrgyos match. The problem is that his hip condition is a deteriorating one in the long term (in his 40s/50s). In th short term It’s not gonna get worse from playing, but neither is going to get any better. He is still limping and can’t push up fully on his serve, plus he is half a step slow getting back in court when pushed out to his forehand side. He is also a competitive animal who doesn’t want to play to lose. So, he either plays the rest of his career for the sheer enjoyment and for his daughters to grow up and watch him play (which he says is his intended wish), but hope of getting back to pre- 2017 where he is a contender look slim. Like his presence was going to affect the draw anyway. This withdrawal is arguably worse than USO17. This kind of conduct is not on IMHO. He is only too well aware of how bad his injury is and how slow the comeback is. He knew weeks ago he wasn't ready for this and waited way too late, again, to withdraw from another major tournament. I hope it doesn't cause too many ructions in the draw. Wishing LL, Jason Jung, the very Murriest of Christmases. How the frig is an unseeded player withdrawing going to seriously affect the draw one way or the other? Yeah, his game is very physical - not see after that major knee job he’ll ever get it back. And switch to a finesse game - too late. For all the talk that hard courts are bad; one misstep on grass and you can tear up a knee, ankle - or hip. Thus wise of Murray to pull out. And he ran out of gas so badly v Kyrgios it was obvious his fitness wasn’t close to ready. Maybe he had a bad practice session or something? Felt a niggle or something. They aren't in his quarter, are they ? Only in his half....tucked away in Djoko's quarter. How is this worse ? He wasn't even seeded...this impacts nobody.